Seattle, WA, USA (April 30, 2014) /PRNewswire/ — Academy Award winner Douglas Trumbull, announced today his forward-looking ten-minute demonstration movie UFOTOG. Produced at TRUMBULL STUDIOS in westernMassachusetts, the experimental sci-fi adventure written and directed by Trumbull in 4K 3D at 120 frames per second, demonstrates his new process called MAGI, which explores a new cinematic language that invites the audience to experience a powerful sense of immersion and impact that is not possible using conventional 24 fps or 3D standards. UFOTOG is a dramatic short story about a lone man attempting to photograph UFOs. Trumbull felt that it would be ideal to premiere UFOTOG at Paul Allen’s iconic Seattle Cinerama Theater as the headlining event at the annual Science Fiction Film Festival Sunday May 11, 2014, in conjunction with special screenings of 2001: A SPACE ODYSSEY and CLOSE ENCOUNTERS OF THE THIRD KIND, both of which have alien contact stories. In addition, Trumbull will introduce his movie BRAINSTORM, on Friday, May 9, which marked the beginning of his quest for immersive cinema. Trumbull Studios partnered with Christie to explore the potential of 3D 4K 120 fps projection, using the latestChristie Mirage 4K35 projection system. A special Mirage system will be installed in the Seattle Cinerama Theater for the premiere of UFOTOG, and the theater will soon offer the first public installation of Christie’s new laser illumination system in the fall of this year. Trumbull Studios is committed to Eyeon Software, which has enabled the production of UFOTOG with the unheard-of impact of 3D in 4K at 120 fps, using Eyeon Fusion, Generation, Connection, and Dimension. “I chose to work with Eyeon because they are the only outfit already prepared to go 3D 4K at 120 fps. They are VFX and Broadcast designers that have sat in our seats and have been under the same pressures as us. Working with Fusion, and their new Generation 3D 4K playback system shows again that Eyeon brings their experience to the current workflow trends and beyond, inventing every day to solve the challenges we pose, and always go the extra mile,” says Trumbull. 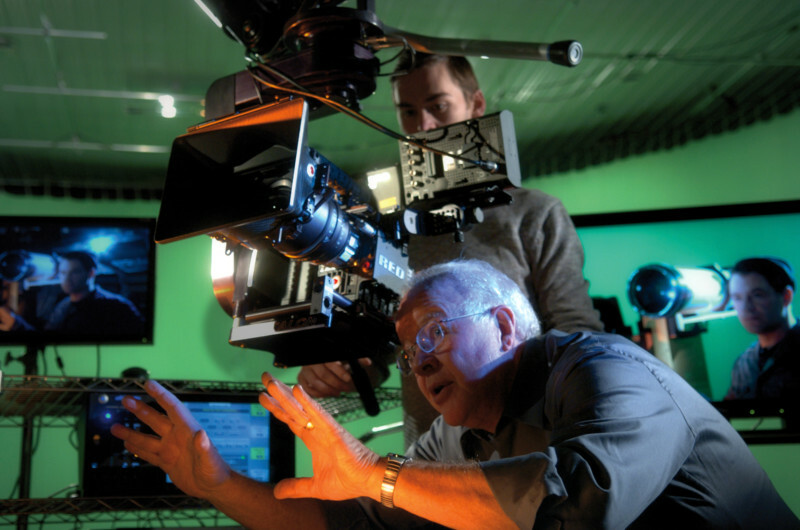 Trumbull’s pioneering work also included his Academy Award winning 70mm 60 frames per second SHOWSCAN process, which was widely acclaimed by industry professionals, and that led to the development of the film BRAINSTORM, which was to debut the process worldwide, with Trumbull directing. Yet in the days of celluloid film and the attendant high 70mm print costs and projector upgrades, the process did not get traction. Now, with digital projectors regularly operating at 144 frames per second for 3D, implementing much higher frame rates and increasing resolution is proving to be a cost-effective way to improve movie impact and profitability. Trumbull is legendary for his ground-breaking visual effects work on films such as 2001: A SPACE ODYSSEY, CLOSE ENCOUNTERS OF THE THIRD KIND, and BLADE RUNNER, as well as his directorial achievements on SILENT RUNNING and BRAINSTORM and special venue projects such as BACK TO THE FUTURE – THE RIDE, and a trilogy of giant screen high frame rate attractions at the Luxor Pyramid in Las Vegas. Trumbull has more recently been pursuing what he believes can usher in a powerful transformation of cinema itself. At a time when the major studios have embarked on a business model to produce only tent pole-franchise-superhero-comic book action films, theater attendance is in decline. Trumbull believes that a jolt of high technology energy is needed to improve the impact of these expensive productions via photographic and exhibition technology that fully delivers the production value that is presently being throttled down by 24 fps, 2K resolution identical to television, and low brightness 3D on small screens. Trumbull Studios includes equipment provided by Christie, Dolby Laboratories, RealD, Eyeon, Stewart Filmscreen, Composite Components, Abel Cine, Vision Research, nVidia, 3Ality Technica, Codex, Motion Analysis, Virident, Limelight Productions, and many more. Facilities include a shooting stage, production offices, multiple workshops, screening rooms, editorial, compositing, and sound mixing. UFOTOG was written and directed by Douglas Trumbull, produced by Julia Hobart Trumbull and Steve Roberts, executive producers Donald Rosenfeld and Andreas Roald, starring Ryan Winkles, director of photographyRichard Sands, original music by Claes Nystrom, produced at Trumbull Studios, with special production services provided by Eyeon.